은 좌안7분면의 복부까지 내려오는 반신상으로, 구슬장식의 끈이 달린 초립(草笠)을 쓰고 담홍색 포(袍)를 입고 있으며 공수자세를 취하고 있다. 얼굴과 의복은 옅은 살색과 그보다 약간 짙은 색상의 미묘하고 절제된 조화로 묘사되고 있다. 양미간을 찌푸리고 있는 표정은 “찌푸린 눈썹에 우수 띤 얼굴이라(攢眉滯愁容)”고 묘사했던 서유영(徐有英, 1801-1874)의 배관기(『雲皐詩抄』)와 상통한데, 눈의 총기가 생생하다. 은 매월당 김시습(1435-1493)의 초상화라는 인물사적 가치 위에 조선시대 야복초상화의 가작이란 점에서 중요성을 지닌다. 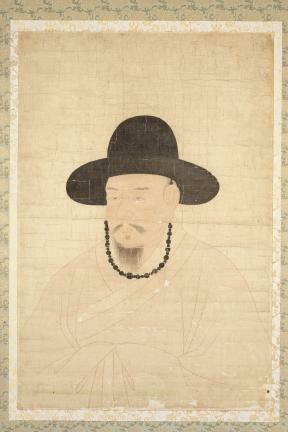 Let alone the historical importance of the subject, this half-length portrait of famous writer Kim Si-seup (1435-1493) by an anonymous painter is estimated as a significant piece depicting an early Joseon-period man dressed in plain clothes. A talented writer but perpetual dissident, Kim is portrayed wearing a pale pink robe and a black bamboo hat with an amber string. A three-quarter view from the left, both his hands are folded under the sleeves. The face and the robe are deftly rendered with restraint using a delicate color wash in a faint skin tone with slightly darker shades. Writing on his impression of the portrait, Seo Yu-yeong (1801-1874) aptly described the face as “melancholic with frowning eyebrows.